The tools and architectural patterns we use to build and evolve web applications have undergone dramatic change over the past few years. Modern web application development is a fast-paced, dynamic activity reliant to ever an greater degree on modular, loosely-coupled application components, rapidly-evolving frameworks, and shorter development cycles. Historically, the ASP.NET ecosystem (including Web Forms, MVC, Web Api, SignalR, and others) sat on top of System.Web, and was tightly coupled to the underlying .NET framework as a whole. Further, ASP.NET web applications have been reliant on Microsoft Internet Information Services (IIS) to provide the hosting environment necessary to run in production. What is OWIN, and Why Do I Care? In the past two years, the ASP.NET team has been evolving the .NET web development ecosystem away from this approach, and instead creating a growing set of pluggable components. Beginning with ASP.NET 4.5.1, we have seen the introduction of more and more pluggable application components which are not dependent on System.Web, and which can be configured to run outside the constraints of IIS using custom hosts. My understanding is that ASP.NET 5 (“vNext”) will be moving way, way further in this direction. Understanding the relationship between the hosting process, the web server, and our application components is going to become increasingly important as the ASP.NET ecosystem becomes more and more modular. More and more, this relationship, and the pluggable architecture upon which our .NET web applications will depend, will be defined by the Open Web Interface for .NET (OWIN) specification. And we need to understand how it works in order to take full advantage of the evolving .NET Web Stack. 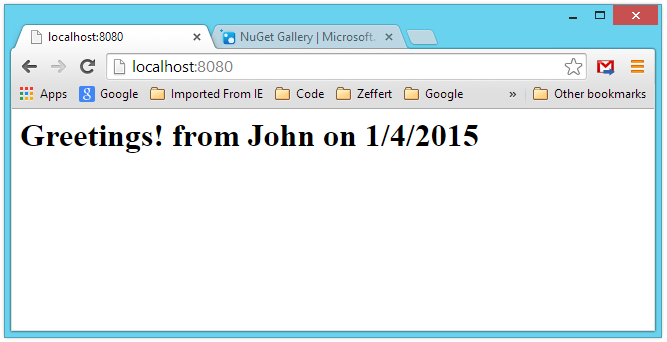 UPDATE 1/5/2015: ASP.NET 5 is indeed moving further in this direction. Katana itself will apparently be fully integrated into ASP.NET 5. OWIN will be available through an interop, but greenfield projects will be best off using the integrated middleware pipeline. However, most of what we discuss here will still apply, either directly, or conceptually (thanks to Rick Anderson and the ASP.NET team for the clarification!). We will examine the ASP.NET 5 middleware pipeline in an upcoming post. OWIN (the Open Web Interface for .NET) is an open-source specification describing an abstraction layer between web servers and application components. The goal of the OWIN specification is to facilitate a simple, pluggable architecture for .NET-based Web applications and the servers upon which they rely, encouraging development of small, focused application components (known as “middlewares” in the OWIN parlance) which can be assembled into a processing pipeline through which the server can then route incoming HTTP requests. OWIN defines a standard interface between .NET web servers and web applications. The goal of the OWIN interface is to decouple server and application, encourage the development of simple modules for .NET web development, and, by being an open standard, stimulate the open source ecosystem of .NET web development tools. OWIN is a specification, not an implementation. As such, OWIN describes a minimal set of types, and a singleapplication delegate through which interactions between an application component and the server will occur. Note that the OWIN specification is an open source community effort independent of Microsoft. Server – The HTTP server that directly communicates with the client and then uses OWIN semantics to process requests. Servers may require an adapter layer that converts to OWIN semantics. Web Framework – A self-contained component on top of OWIN exposing its own object model or API that applications may use to facilitate request processing. Web Frameworks may require an adapter layer that converts from OWIN semantics. Web Application – A specific application, possibly built on top of a Web Framework, which is run using OWIN compatible Servers. Host – The process an application and server execute inside of, primarily responsible for application startup. Some Servers are also Hosts. The host in an OWIN-compatible application provides an Environment Dictionary in the form ofIDictionary<string, object> containing all of the relevant information about the request, response, and server/host information. The OWIN specification defines a minimum set of keys and values which must be present in the dictionary. However, servers, host environments, middleware, and application code may add additional data, or modify the data in the dictionary as a result of processing. As mentioned above, OWIN also specifies a primary interface, the Application Delegate (also known as AppFunc). Interactions between the server and application components occurs through calls to the AppFunc delegate. An Application Delegate function will take the Environment Dictionary (IDictionary<string, object>) as an argument, use the request/response information contained in the environment dictionary to perform whatever processing is required to meet its responsibilities, and return a Task when processing is complete. In keeping with the above, individual application components (middleware) perform their processing duties when theAppFunc delgate is called. However, in order to maintain the pipeline, each middleware component is also responsible for invoking the next component in the chain (or, intentionally NOT calling the next component and short-circuiting the chain if appropriate. In light of this, each middleware component needs to provide an AppFunc delegate to be called in order to do its own work in the pipeline, and also needs to receive a reference to the next AppFunc delegate, to be called (in most cases) once the current component has completed processing. We’ll see how all this works shortly. Katana is a set of open source components for building and hosting OWIN-based web applications, maintained by the Microsoft Open Technologies Group. 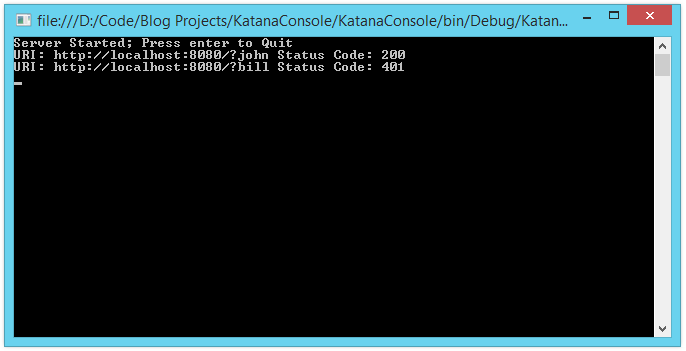 Katana provides an implementation of the OWIN specification, and is in fact used in an increasing number of ASP.NET project templates. Additionally, Katana provides a wide variety of ready-to-use middleware components, ready for use in an OWIN-based application. The best way to understand how OWIN, Katana, and the middleware pipeline works is, well, to jump in and mess about. The Microsoft.Owin.Hosting package added a few library references to our project, notably Owin,Microsoft.Owin, and of course, Microsoft.Owin.Hosting. With that, we have everything we need to put together a simple self-hosted web application. Most of the examples we examine in this post will be overly (some might say “stupidly”) simple, and let’s bear in mind that we are focusing more on how basic middleware are constructed, and how the middleware pipeline works in general than we are on how to write specific middleware components, or how to use all of the Katana features. I stick with silly examples here so that we are focused on the core middleware structure, and how the pipeline works, and not on complex middleware implementation details. Now, let’s take a look at a few items of note here. First off, we have added an alias for the Application Delegate, so that in our code, we can refer to Func<IDictionary<string, object> , Task> by the name AppFunc. Next, we have added a method to the Startup class, MyMiddleware(), which accepts an argument of typeAppFunc named next, and returns and AppFunc. If we look closely, we see that the anonymous function returned by the MyMiddleware() method, when invoked by the host against an incoming HTTP request, will perform some basic processing against the incoming request (actually, writing to the response body), and will then invoke theAppFunc next passed in as an argument, passing to it the environment dictionary, and thereby continuing the pipeline processing of the request. Bear in mind that the MyMiddleware() method simply returns the anonymous function to the caller, but does not invoke it. The function will be added the to request processing pipeline, and will be invoked when an incoming HTTP request needs to be processed. Most importantly, let’s take a look at the Startup class. The Startup class is specified as a command line argument, or a type argument (where applicable) when the host in initialized (usually when using OwinHost, or the Owin.Hosting API, which is what we did in our code above). The host will scan the loaded assemblies for the OwinStartup attribute and uses the type specified in the attribute. If all of the preceding methods fail, then the host will use reflection and scan the loaded assemblies for a type named Startup with a method with the name and signature void Configuration(IAppBuilder). The Startup class must provide a public Configuration() method, as mentioned above, with the signature voidConfigure(IAppBuilder app). The IAppBuilder interface is NOT a part of the OWIN specification. It is, however, a required component for a Katana host. The IAppBuilder interface provides a core set of methods required to implement the OWIN standard, and serves as a base for additional extension methods for implementing middleware. When the Katana host initializes the Startup class and calls Configuration(), a concrete instance ofIAppBuilder is passed as the argument. We then use IAppBuilder to configure and add the application middleware components we need for our application, assembling the pipeline through which incoming HTTP requests will be processed. The most common way to add middleware is by passing components to the Use() method. Middleware components will be added to the pipeline in the order they are passed to Use(). This is important to bear in mind as we configure our pipeline, as this will determine the order in which processing is applied to incoming requests (and in reverse, to outgoing responses). In our code, we grab a reference to our middleware function by calling MyMiddleware(), and then add it to the pipeline be passing it to app.Use(). Presto! We have created a bare-bones, self-hosted web application using only a console application, and a handful of small Katana components. 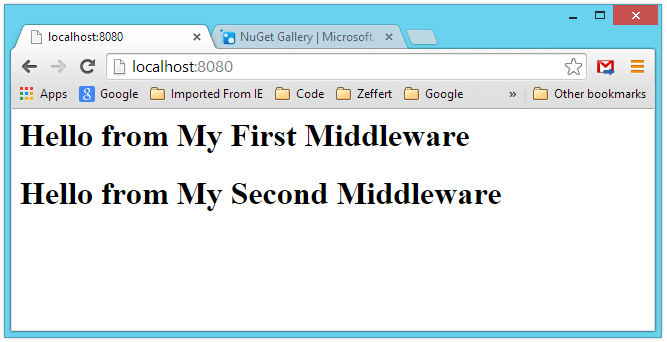 More importantly, we have created our first OWIN middleware. Now, let’s see how the whole pipeline/chaining thing works. 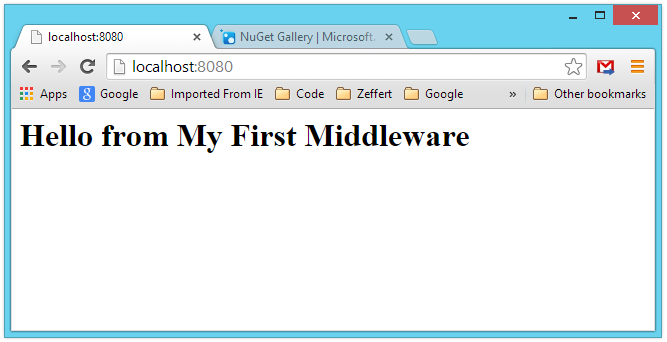 Thus far, we have created an application with a single middleware component in the pipeline. While we properly included a parameter in our middleware function for a “next” AppFunc to be invoke, there is nothing to work with at the moment. Thus far we have implemented a very basic OWIN-based Processing pipeline, using the raw types expected by the OWIN specification. Now let’s see if we can make life a little easier, using some tools provided by Katana, and by laying some abstraction on our middlewares to make them easier to think about. In our previous example, we worked with the raw Environment Dictionary as specified by OWIN. This provides a flexible, low-level mechanism, but is less than handy when we want to work with strongly-typed objects, and perhaps raise our abstractions up a level in our pipeline implementation code. In fact, the IOwinContext object, and similar interfaces provided by Katana such as IOwinRequest andIOwinResponse provide a large number of useful, strongly-typed abstractions which simplify our interaction with the environment. These interfaces are, in fact, quite similar to the familiar HttpContext, HttpRequest, andHttpResponse objects we are accustomed to using in a standard MVC or Web Api application. So far, we’ve taken the raw, bare-bones approach to creating middleware for our application, by using a method with the signature Func<AppFunc, AppFunc> and pushing it into our pipeline. However, a more modular approach would be to create our middleware are individual classes. We can do this, so long as the class we create adheres to some specific requirements. The class must have a constructor which accepts an argument of (wait for it…) AppFunc, and must provide a method named Invoke which accepts an argument of IDictionary<string, object> and returns Task. Note, we have pulled our Func<AppFunc, AppFunc> methods out and refactored them into classes. Also, we have modified our Configuration() method on the Startup class to use the overloaded Use<T>() method, which allows us to specify the type which represents our middleware as a generic type argument. Once again, we can run our application as-is, and all should work as expected. Middleware implementations often utilize extension methods to extend the IAppBuilder interface, making it easier for the developer to add middleware into the pipeline. Once again, running our application, and refreshing the browser, we see everything still works as expected. In our simplistic example here, we were able add a string argument to our middleware constructor, and everything worked out just fine. More commonly though, middleware will likely require more configuration options. Also, this does not represent a very modular design approach. Instead, we might be better off using a configuration class, to be passed to the constructor instead. To take our contrived example to the limit, let’s rethink how we have implemented the configuration options for our middleware. Instead of passing in an arbitrary string when we add the middleware to the pipeline, lets create a configuration class which will use some pre-defined elements to construct a message. Ok, we have just about exhausted the usefulness of these two example middleware components. Let’s take a look at some (still silly and contrived) mocked up components that represent something we might actually find in a pipeline. As before, we are going to use some overly simple, contrived examples here. Katana actually provides for the addition of both Logging and Authentication components, and we aren’t going to get bogged down in the complexities of writing code to actually perform either of these functions beyond mocking their effects on pipeline flow. Each of those topics could (and probably will be) a post unto itself. For now, let’s add two new classes to our project. This time, though, let’s add these as individual class files. This means we will need to specify our AppFunc alias in each class, as well as make sure the using statements at the top of the file include Microsoft.Owin. In the above code, note that we totally fake an authorization request. Instead of grabbing an auth token from the request header or some other secure way of doing things, we are cheating, and simply passing in a query string to check. 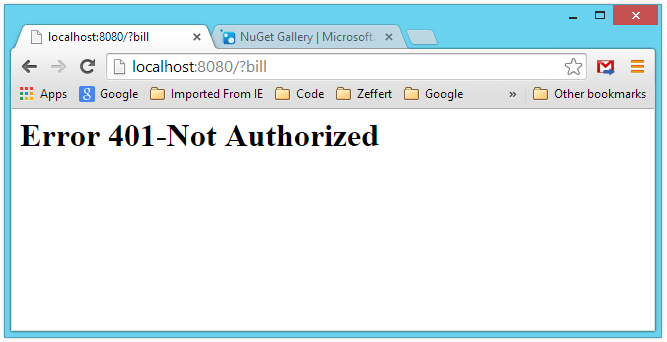 Also notice that if authorization fails, _next is never invoked. This matters in a moment. Here, we are logging the incoming URI, and the status code of each request. Since we want to know the status code AFTER the request has been processed, we are going to place this component first in the pipeline, but do no processing until after the call to _next.Invoke() returns. In other words, we want to log status after all subsequent processing happens. Now let’s see how we might use these examples in modeling some “real-world” application behavior. Recall our diagram of the middleware pipeline. We have a basic idea of how the request/response flow is supposed to occur under normal circumstances. Let’s use our two new middlewares, and re-configure our application somewhat. First, we want to log the URL for each incoming request, and the status code of the response for each. Since we can’t know the final status code until all of the pipeline processing has completed, we will put this middleware in the pipeline first. in other words, the logging middleware will be the first component to see each incoming request, and the last component to see the outgoing repose. Next, we will add our Authentication component. We want to test authentication early in the pipeline, and prevent unauthorized users from proceeding any further than necessary into our application. 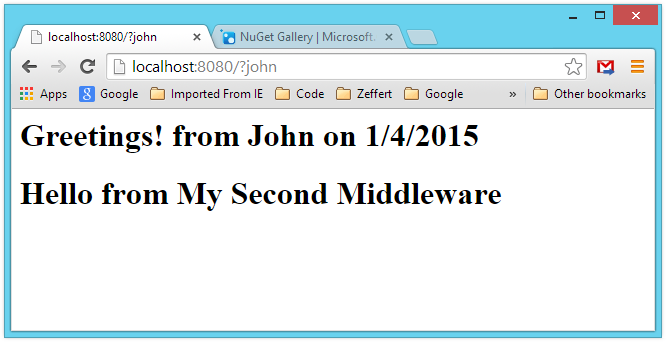 Finally, we will add our MyMiddleware component, which display a helpful greeting in the browser window. Well THAT’S interesting… even though everything seems to have worked, we are getting a 404 (“Not Found”) status code. This is because the last middleware in our pipeline is calling _next.Invoke() , but there is no AppFunc available to call. In a real middleware, this would likely need some proper handling. In our case, the MyMiddleWareComponent actually appears to be designed to be a final component in a chain (the one writing to the response body and returning to the client), so we could actually place the work of the component after the call to invoke _next, knowing that unless some really special circumstances arose, there will not likely be any additional components. If we run things again with our modified code, we should see the expected 200 OK response status in the console output. So what happened here in terms of our pipeline? Unlike most of what we have done here, most of the time, OWIN middleware would tend to be composed as a stand-alone assembly in its own class library. Most likely, the middleware itself will take some dependencies on other libraries, but it would not tend to be part of the application assembly itself. To carry our most recent examples to their logical conclusion, we might extract each of our middleware components into its own project, which, when ready for deployment, we might even host on Nuget as packages to be added to client projects. Once we have done that, we can use Manage Nuget Packages for Solution to add the Microsoft.Owin package to our new class library. Note in the above, that we have changed the name of the class from SillyAuthenticationComponent to simply SillyAuthentication. Secondly, if we copies the code from the original project, we need to change the namespace from KatanaConsole to SillyAuthentication. Also, the way we set the alias for AppFunc must be specified for each code file where the alias will be used, so we need to do that here as well. Obviously, since this assembly is specific to our SillyAuthentication component, we don’t need the other extension methods we defined in our original project. We can do the same thing for our other components and we should have separate assemblies for the authentication component, the logging component, and our MyMidddleware component. In each case, we will probably want to rename the classes, dropping the “component” from each class name. Also, we need to use Manage Nuget Packages for Solution and bring Microsoft.Owin into each project. Make sure to specify the AppFunc alias in each file. Finally, for the MyMiddleware project, we will make sure to bring the MyMiddlewareConfiguration into the project as well. Now, we can remove the SillyAuthenticationComponent class from our example project, as well as delete the extension method we created related to the SillyAuthenticationComponent class. If we go to Solution Explorer => Project Dependencies and indicate that KatanaConsole depends all three of our new class library assemblies, and then also add a reference to each assembly using References => Add Reference, we are ready to clean up and simplify our Project.cs file. If we have done everything correctly, and didn’t miss a namespace change or anything like that, ourKatanaConsole application should run exactly as before. 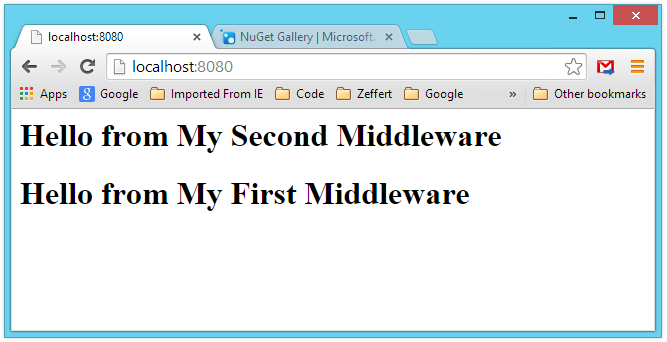 However, this time, we have pulled in our custom middleware as references, which could just as easily come from Nuget. In fact, the code in our Startup class may look fairly familiar to you. If you take a look at the Startup.auth.cs file from the Web Api project template, you will see similar goings on, as ASP.NET Identity components are added to the OWIN pipeline. In this post we have taken a look at how the OWIN/Katana pipeline works, seen some of the basics of how middleware is created and added to the pipeline, and developed an understanding of how our application interacts with the server in an OWIN-based environment. For one thing, more and more of the .NET web development ecosystem is moving in this direction. At present, ASP.NET Web Api can be hosted directly in the OWIN/Katana pipeline (although in the template projects available in Visual Studio, the Web Api is added to the ASP.NET/System.Web pipeline instead), and the ASP.NET Identity Framework IS added to the Katana pipeline. My understanding is, going forward ASP.NET 5 (“vNext”) is going to go all the way in this direction, with the various bits and pieces we want to add to our project added as pipeline components. Understanding the hosting and server environment, and being able to dig down into the abstractions will allow us to better leverage the tools at our disposal, and write better, learner, meaner applications. Are we going to be writing a bunch of custom middleware components ourselves? Likely not. But understanding how the pieces fit is important.